It has been forty-three-years since Spielberg’s industry-changing blockbuster Jaws scared swimmers out of the summer waters, so now enters The Meg, hardly the first film to update the summer shark horror genre (just a few short years after Jaws Roger Corman’s B-movie Piranha copied it more shamelessly), but it is certainly the most energetic and most relentlessly action-filled. This is probably a good thing given what would be considered a slow pace by today’s standards of Spielberg’s film. The Millennial and Gen Z crowd will surely appreciate this faster-paced derivative update on the ‘70s classic, although it can hardly hold a candle to that’s one’s pathos and revolutionary filmmaking. In The Meg, Jason Statham — who has made a career out of appearing in these adrenalin-fueled action films with heavy Chinese financing – plays expert diver and former Naval Captain Naval Captain Jonas Taylor. After surviving an attack in the unexplored depths of the Mariana Trench five years earlier that caused him to abandon his mission and half his crew and garnered him a dishonorable discharge, Taylor returns to a massive research facility in the middle of the ocean to help rescue a submersible doing research, among the crew his ex-wife. There, he encounters the same massive 70-foot creature no one believed he saw five-years earlier – and now they know what it is, a long-believed extinct megalodon, a giant prehistoric shark. Rainn Wilson, Li Bingbing, Winston Chao, Page Kennedy, and Ruby Rose also star in this overblown sci-fi/horror spectacle. The Meg borrows heavily from most of the tropes of this much-visited genre – the chaotic beach scene, the helpless boat in the middle of the ocean under attack by the relentless sea creature, the selfless and courage hero who braves the depths – and jaws of death – to save others. Where it diverges of course from the films before it are the stunning visual effects, its unapologetic commitment to breathless action sequences, and seamless mixture of thrills, horror, and “on no they didn’t” comedy/horror. John Turteltaub handles all of this brilliantly and the cast have a good rapport, but they do try to force a romantic subplot between Statham and Bingbing that is more awkward than hot – perhaps there’s just too much cold water around for that to heat up. Otherwise, The Meg is satisfying summer popcorn fun and one of the best updates on the summer shark attack genre I’ve seen since Jaws. The film was shot on the Arri Alexa Mini with Zeiss Master anamorphic lenses and the Arri Alexa SXT with Zeiss Master Anamorphic and Angenieux Optimo lenses at 2.8K resolution. A 2K DI was used in mastering and the film was mastered with Dolby Vision HDR and it also arrives on this 4K Ultra HD Blu-ray with Dolby Vision, encoded in HEVC 2160p (4K) framed at 2.40:1. It looks stunning to say the least. The cerulean waters sparkle in the daylight thanks to the dynamics and the wide color gamut, and the shadows in the underwater sequences are exceptionally nuanced. Night scenes of the cityscapes and shorelines ‘pop’ from the screen. Detail is crisp and there’s excellent depth of field. The Meg hits 4K Ultra HD Blu-ray with an awesome Dolby Atmos sound mix that will likely become a go-to showpiece for enthusiasts with its bombastic low-end, awesome use of the Atmos overhead channels, and superb balance that keeps the dialogue clean and clear. There isn’t much included on the disc, but the three featurettes are interesting even if one is a throwaway advertisement in disguise for the Kiwi film industry. Nothing can ever live up to that famous Spielberg original blockbuster that pretty much kicked off this whole genre, but The Meg is a wild ride that must be seen and this 4K Ultra HD Blu-ray release from Warner is an excellent way to see it. It’s an instant home theater reference release of a fun popcorn flick. 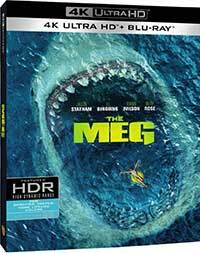 The Meg is out on 4K Ultra HD Combo Pack, Blu-ray 3D Combo Pack & Blu-ray November 13, 2018 from Warner Bros.
A scientist must save his crew stuck in a submersible from a prehistoric megalodon in this new twist on the summer shark attack horror flick featuring Jason Statham and Li Bingbing. The story doesn't run deep in The Meg, but it's a fun, wild ride and the 4K Ultra HD release from Warner Bros. is fantastic.